Who is the Best Dog Trainer for your Dog? You Are! | Leader of the Pack Home Dog Training | Proudly Serving the Inland Empire.Riverside, Orange and San Bernardino Counties. Who is the Best Dog Trainer for your Dog? You Are! 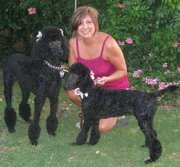 I was in Corona, yesterday with a Home Dog Training client and their rambunctious Poodle named Brodie. Like many poodles, Brodie was a little animated and loved to jump on people, run to the door barking, pulling on the leash and lunging at other dogs. At our first session, the family learned what to do to stop her from jumping, running to the door barking, to walk nicely on the leash, etc. Brodie’s problem was that he felt he was in charge of his human/dog pack, and didn’t respect or obey his owners because he didn’t have any leadership or guidance from them. Fortunately, they now have the right tools and know how to provide proper leadership and effectively begin training her every day. As I was leaving, one of my client’s neighbors approached me as I was getting in my car. He wanted to know about the training. He said he was always busy and wanted me to train his eight-month old boxer. He said he would even give me a key so I could get into the house to train when he was not home. I explained to my client’s neighbor that there are many dog trainers who say “they will train and fix your dog” so that you will have a “great family dog”. That is not the way that I view the situation. Dog training is about building a relationship between you and your dog. Training is not a “fix” for your dog that’s trained, by someone else’s sometimes, questionable methods. Training builds an amazing bond – your dog should mind you because they want to! Training is not a task that once completed its over – it’s a lifetime interaction. Some owners choose the Board & Train method because they are too busy to train the dog themselves. If you do not have time to spend with your dog, please do not get one. This is one of those “Tips” I have learned over the years. Be very careful of someone who says they can “fix” all your dog’s problems if the dog lives with them or in their kennel for a specific period of time. Please understand that there are a lot of GREAT dog trainers out there! But my experience with this kind of training (even from a trainer’s perspective) is not good. Kennel Training. Why this is not good… Usually this is very expensive and usually it is “guaranteed”. It is guaranteed, because the dog will obey the trainer, but will they obey you? I could charge you $3000 for a couple weeks of “guaranteed” training and promise to fix any problem. But one of the problems is that the dog will work for ME. It is true that I can train dogs to be great dogs. They won’t jump on people or steal food from the table. They will walk nicely with me, obey obedience commands, and not bark insensately at the neighbors. None of these things are overly difficult if the appropriate relationship of bond, trust, and respect have been established between me and the dog. But…That doesn’t mean YOU will have all these attributes when your dog comes home. Ultimately they are going to live with YOU not me! Life in the Kennel… How often do you think your pup will come out of his crate or kennel? Most often, it is only once (maybe twice) per day for 15 minutes to an hour, if he is lucky. The rest of the time he will be sitting in a kennel. Remember how I said I only need a few minutes to work miracles with your dog? Even if he was living with me that is all I would need. The odds of interaction are not in your dog’s favor!!! Even if your trainer swears they will live with him, be leery! Compulsion is Faster Beware! Compulsion; prong collars, choke chains, and shock collars are faster and the trainer doesn’t have to deal with the repercussions later in the training process. At Leader of the Pack Home Dog Training, we NEVER use these methods. Want a Happy, Well-Behaved Dog? Learn to train them yourself! In order for your dog to change and obey you — YOU need to be involved. Your pup needs/wants to do what YOU tell them to do. Once you know the methods of leadership and techniques to train your dog, it should only take about 30 minutes per day working with your dog. These learned techniques you can use throughout your life, with all of your dogs. Training your dog yourself, is exactly what you should do to have a happy, well behaved and obedient dog who WANTS to obey you. It is up to you. As your “dog’s trainer”, I can teach and guide you in the right direction. You should take the journey. And, by the way, it is really a wonderful journey! So, when you think “I need a dog trainer for my crazy dog”, you are really asking for a trainer for yourself. About Wendy’s First Dog Training Experience: When I was a 12 years old I got my first dog. My mother took me to a dog trainer who wouldn’t accept me into her school, she said I was too young and wouldn’t follow through. I promised her that I would. The trainer never touched my dog, she showed me what to do and I practiced. By the time I was 15, my girl “Bebe” and I achieved the AKC Obedience Title “Companion Dog”. Bebe and I had the best relationship possible; it was a wonderful, memorable learning experience.